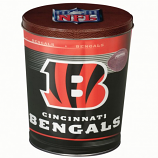 These collectible NFL gift tins can be filled with any 3 of our gourmet popcorn flavors (your choice.) 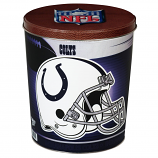 Make everyone of your sports fans happy with this delicious collectible gift. Flavors; Butter, Cheddar, White Cheddar, Kettle, Bacon-n-cheese, Dill, Parmesan Garlic, Old Bay, Summer Salt, Caramel, Cinnamon Red Hot, Cheesy Ranch, Duck's Duo, Jalapeno Cheddar, Watermelon, Cinnamon Twist, Corolla Crunch, Drizzle, Pirate's Blend, S'mores and more!